Hey guys, another late night post from me, but not quite as late this time. I just have so many things to post that I feel like doing multiple per day. I'm really into this swatch project thing. I have sorry cuticles now, but I enjoyed it. I'm trying to do everything I own by a brand at once. So I'm starting with smaller sets of things I have, like L.A. Colors and Revlon. I'll be posting them in sets I guess! Anyway, so because I have so many things to post, I wanted to show you guys 2 sets of nails I did for my friends this past week! I did my friend Nicole's nails on Sunday. Cupcakes and leopard print! Enlarge the photo to see it better. The colors I used on Nicole's manicure were Sally Hansen Insta-Dri Brisk Blue, Presto Pink, and Whirlwind White. The cupcake detailling was done by mixing the colors with white. I did the leopard with my black nail art pen. Tonight, my bestie/soulmate Emma and I went to The Hangover 2 with our new friend Nina! It was pretty awesome. Not quite as good as the first but still hilarious. Before the movie, I did Emma's nails. She was already wearing a For Audrey dupe and we made it much better! Enlarge the photo to see all the awesome! I have nothing better to do so I'll tell you what I did on all her fingers. Her thumbs consist of one cupcake, done the same way as Nicole's, and a floral nail! Her middle fingers have cute lacey/finial/whatever patterns from the new BM plates. OPI - Dim Sum Plum is the pink. Her ring fingers? Milani Jewel FX in Silver and For Audrey dupe with OPI - Last Friday night layered on top. One pinky is a fishtail with the F.A. dupe, Dim Sum Plum, and Milani Nail Art in Purple Outline. Her other pinky is special - a black cat in memory of Emma's cat, Miss Puss! From the original BM set. Emma loves everything so we did everything. Haha. I hope you enjoyed seeing my art on other people's nails for a change! Nighty night. Mmm. Those cupcakes look so good! Makes me want a cupcake. Which is not so good. All of it is so cute! Especially the cupcakes, I want those on my nails so bad. I ADORE those cupcakes. Oodles of cute! CUTE! where you get those small colored beads (on cupcakes)? The movie was a lot of fun, thanks again for inviting me! Loved the skittle nails too. I meant manis not manies. lol. i absolutely love the cupcakes! 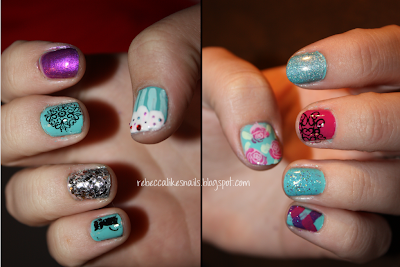 :) awesome manis! I adore the miss puss nail! I want that plate so i can have her with me whenever I want! I had a load of fun that night! Love the thumb with the floral nail! I have really been wanting to do nails like this for awhile! my first franken aka my new favorite polish! new gradient zebra + TUTORIAL! finally i can use this plate!